Herbalists refer to the plant as lemon balm, aromatherapists use the botanical name melissa, both refer to the same plant, Melissa officinalis. 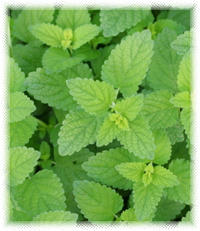 Lemon balm is an aromatic mint with a venerable reputation for having calming properties. Lemon balm can be very helpful for those times when nerves, headaches and/or mild depression are preventing you from relaxing and getting a good nights sleep. Combined with valerian, it may even be more beneficial than many prescription sleep aids. (Balch, Phyllis A.) Lemon balm's sedative and analgesic properties make it a favorite remedy for women having cramping, painful periods or any kind of stomach upset. Preparation Methods & Dosage :Lemon balm Leaf tea, extracts, and the essential oil, melissa are all commonly used. Lemon balm is used to flavor chicken and fish, use it in any recipes that call for a lemon type seasoning. 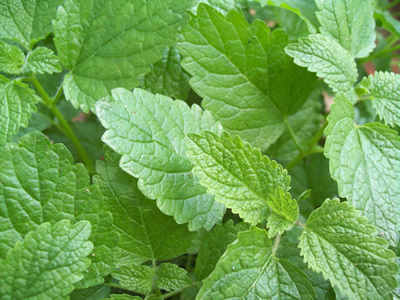 Lemon balm leaves are the source of a pale yellow oil with a light, fresh lemony aroma. Powerful and soothing, melissa oil can have a sedative effect even in minute concentrations. In the Kitchen: Lemon balm is used to flavor chicken and fish, use it in any recipes that call for a lemon type seasoning. Lemon Balm Side Effects: None reported, lemon balm is considered a very safe herb even for babies and the frail. Distribution:widely grown in the Mediterranean and France and over much of the eastern and central US. Prefers warm climates. Lemon balm grows easily from seed, and is not fussy about soil. If you allow it to go to seed, you will find lemon balm coming up in unexpected places the next year. Like all mint relatives, it likes a bit of shade from the hot afternoon sun. You can propagate by taking cuttings from vigorous growth in the summer, or by root division in the spring and fall. Harvest leaves all summer by pinching the topmost growth, this will help the plant bush out and not be so lanky. Balch, Phyllis A. CNC. "Prescription for Herbal Healing" Avery, (2002) A double-blind study of twenty people with insomnia compared the benefits of 0.125 milligrams of the sedative triazolam (Hal-cion) against placebo and a combination of valerian and lemon balm. The herbal combination was found to be as effective as the drug.